Organized crime in the twenty-first century is a knowledge war that poses an incalculable global threat to the world economy and harm to society - the economic and social costs are estimated at upwards of GBP20 billion a year for the UK alone (SOCA 2006/7). 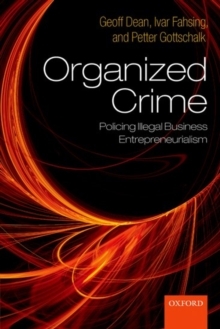 Organized Crime: Policing Illegal Business Entrepreneurialism offers a unique approach to the tackling of this area by exploring how it works through the conceptual framework of a business enterprise. Structured in three parts, the book progresses systematically through key areas and concepts integral to dealing effectively with the myriad contemporary forms of organised crime and provides insights on where, how and when to disrupt and dismantle a criminal business activity through current policing practices and policies. From the initial set up of a crime business through to the long term forecasting for growth and profitability, the authors dissect and analyse the different phases of thebusiness enterprise and propose a 'Knowledge-Managed Policing' (KMP) approach to criminal entrepreneurialism. Combining conceptual and practical issues, this is a must-have reference for all police professionals, policing academics and government policy makers who are interested in a Strategy-led, Intelligence supported, Knowledge-Managed approach to policing illegal business entrepreneurialism.